West Windsor, N.J. – MCCC alumnus Eugene Marsh ’10 (A.S., Architecture) provided a stirring closing to Black History Month at Mercer County Community College (MCCC) as he shared his story of growing up in the segregated South and overcoming the hardships of his childhood. 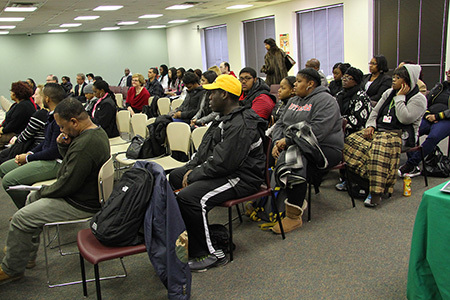 The closing ceremony took place Feb. 26 at the college's Trenton Campus (TC) before a crowd of students, staff and community guests. Growing up as one of 13 children in a foster home in rural Georgia, Marsh enlisted in the U.S. Army during the Vietnam War. After returning home, he went to work for Duke Power Company. Ultimately he moved to New Jersey and in 1998 founded the Princeton-based construction company Construction Management Services. He is a distinguished college graduate, first from MCCC in 2010 and then from Rider University in 2014. “I am where I am because of the bridges I crossed,” Marsh said. “I did not let barriers limit what I would become. Education is a driving force for all of us." Marsh is also fully engaged in his community. He is a member of the MCCC Foundation Board, the Mercer County Chamber of Commerce, United Way and the Trenton Board of Education. He said he is most proud of his participation in 100 Black Men of America, an organization that mentors young people. "The torch has been passed to me and now I am passing it to you," Marsh told the students. "Work to change the attitude of America. We are all on this ship together working to make a difference." Said TC Provost Monica Weaver, "I wish for all the students here today to embrace Mr. Marsh's story and intertwine it with their own. We hope that you will be standing here in a few short years talking to the crowd." Also participating in the ceremony were Brian Cody, Alvyn Haywood and Terrence Carter. 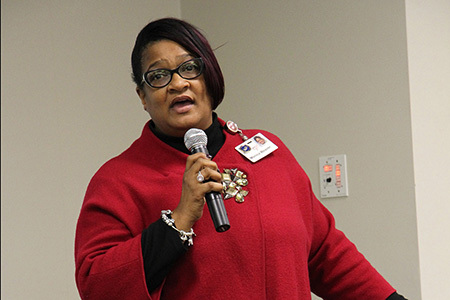 President Patricia C. Donohue expressed her appreciation to the Black History Month committee for developing a diverse array of events that highlighted the accomplishments, achievements and successes of the Black community. She acknowledged the work of committee members Lucia Brown-Joseph, Kimberly Bowser, Brian Cody, Stacy Denton,Corvena Francis-Denton, Stacy Denton, Tiffany Laramore, Craig Morris, Monique Richardson and Diane Romulus. 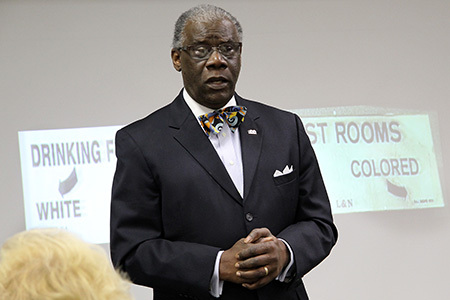 Alumnus Eugene Marsh shared his journey at the closing ceremony for Black History Month. 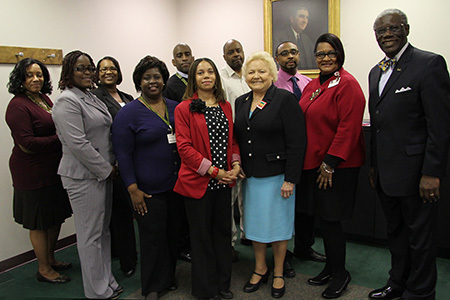 Black History Month participants included, front row from left, Corvena Denton, Diane Romulus, Monique Richardson, President Patricia C. Donohue, Trenton Provost Monica Weaver, and special guest Eugene Marsh; back row from left, Kimberly Bowser, Stacy Denton, Terrence Carter, Brian Cody and Craig Morris. Not pictured: Lucia Brown-Joseph. The audience included students, staff and community guests. 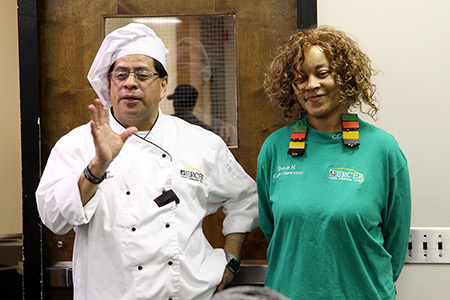 Chef Jorge Maldonado, coordinator of the Career Training Institute's Culinary Program, with a student who prepared treats for the crowd. Trenton Campus Provost encouraged students to embrace Eugene Marsh's call to make a difference.